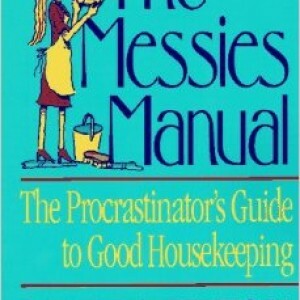 If you are looking for an interesting book to read on housekeeping, I would highly recommend Sandra Felton’s book The Messies Manual: The Procrastinator’s Guide to Good Housekeeping. Even though this book has been around for a while, first being printed in the 1980’s, its pages truly do hold a great deal of wisdom. Offering a fresh dose of common sense, this book will help you set realistic goals to make home cleaning & organization a breeze. One of the topics I found especially useful in the book was her outlining of the Mount Vernon Method. Simply put, the Mount Vernon method calls for all housekeeping tasks to be broken down into more manageable slices. For example, let’s say that your home hasn’t been deep cleaned in a long time and you want to get started cleaning right away. While your first response, born of frustration, would probably be to get everything clean in one day, the Mount Vernon method says relax and get organized. Make plans over a period of days and weeks to start the cleaning process in one room while slowly moving to the next. Cleaning this way lowers stress and makes everything more manageable. Which is why we have adopted the same system at Tidy Tim’s. In case you haven’t noticed, we have recently changed our invoices to reflect our detail cleaning services. While cleaning companies have always offered deep cleaning services in the spring and fall, we have found that a balanced approach of detail cleaning throughout the year provides greater value for our customers. The way we apply the Mount Vernon method is by detail cleaning one room each visit. By breaking it down in this fashion a bi-weekly customer, with a standard eight room house, gets three full detail cleanings per year instead of in just the spring and fall. Again, I would high recommend buying this book if you are into housekeeping books. There are newer editions available and can be found on www.amazon.com.